OS grid reference: SE 9402 1028. Roughly ½ a mile east of the Appleby Frodingham steelworks (Scunthorpe) and about halfway between Broughton and Santon, in north Lincolnshire, is the ‘lost’ hamlet of Gokewell with the scant remains and earthworks that are all that is left of the small religious house of Gokewell Priory, covering up to 1 acre of land. Standing just a little to the north “was” Gokewell Priory Farm (now demolished*) around which there are some very scant stone foundations, earthworks, ditches and ponds, all that is left of the medieval priory that housed Cistercian nuns between the late 12th and the early 16th centuries. The site now lies in the parish of Broughton, and an area of bushes marks the site where the farm used to stand. The hamlet of Gokewell is virtually gone. 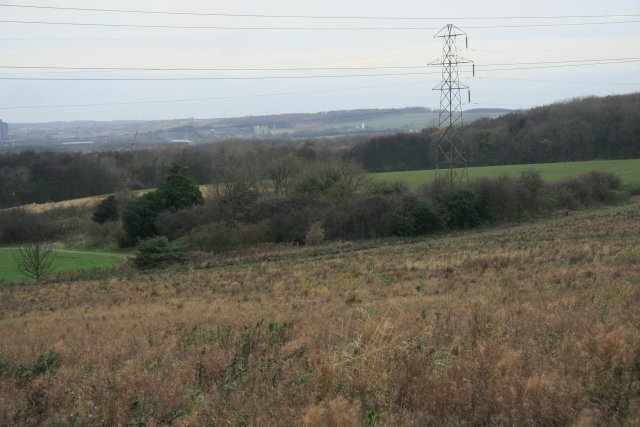 Of the site itself there is little remaining today, while all around it there are ploughed fields that are usually covered in crops during the summer months but, there are footpaths around the periphery of the earthworks and, Santon Wood is just a short distance to the north – otherwise the priory earthworks are for the ‘most part’ on private land. The village of Broughton is 1 mile to the south-east on the B1207 (Appleby Lane) which is, in fact, the course of the Roman road Ermine Street; the roman road itself runs straight through the village centre. There was a holy well at Gokewell called Nun’s Well, but the site could date back to the Dark Ages or to pre-Christian times? The small priory with a school-room for poor children was ‘probably’ founded in 1185 by William de Alta Ripa but, it’s possible that it was founded a little earlier in 1148; there were three other local benefactors who also gave ‘money’ for the establishment of the religious house, which was run by Cistercian nuns, with the first recorded prioress being a noblewoman called Avice (1234). From what we know, and its not very much, the priory never had much money (for its up-keep) and at any one time there was never more than ten or eleven religious sisters here and, even less on some occassions; at the Dissolution in 1536, only seven sisters remained! The sisters would have lived a “very” spartan life, with a life of prayer and penence, and besides that very little in the way of food, apart from fish from their ponds (still to be seen today), and food stuffs given to them by local people, their clothes were bought by their own families. However, they did take in ‘poor’ children, mainly boys under the age of eight and girls under ten years. The rector of Flixborough was their steward but they were always much in debt to him; however a number of northern bishops found the house to be ‘in good order’ and offered their protection against local thieves and troublemakers. We know that the yearly revenue of Gokewell priory never exceeded £10! In 1536 the priory of Gokewell was abandoned, seemingly without any fuss, and the sisters dispersed to the locality, while the last prioress Anne (of) Castleford was given an annual pension of £4 and was still living in 1553. But it seems the prioress was not highly thought of by the younger nuns, in deed they took no notice of her and even apparently referrred to her as ‘a simpleton’; she also failed in her ability to discipline the nuns. Eventually the stonework from the priory was re-used in the building of the nearby Priory Farm; much of this carved and dressed stonework ‘could’ still be seen in the farm’s walls and its out-buildings (*the farm has long since been demolished). The land where the priory stood was flattened for farming purposes; however one large round-shaped fish-pond remains and a few smaller ponds can be made out, along with ditches, earthworks and ‘lumps and bumps’ beneath which, scant stone foundations remain. Footnote:- My Great-Great-Great-Great Grandparents Thomas and Rebecca Spencer lived at Gokewell Priory Farm from 1815-25, afterwhich they moved to Messingham. Thomas died in 1863 and is buried in the cemetary there. Page, William., A History Of The County Of Lincoln, Volume 2, pages 156-7, 1906. Pryme, Abraham de la., Ephemeris Vitae: A Diary of My Own Life, Vol 54, Surtees Society, 1870. *Photo: © Copyright Robert Reynolds and licensed for reuse under this Creative Commons Licence. Categories: Abbey or Priory | Tags: Gokewell Priory at Broughton in North Lincolnshire, Nun's Well at Gokewell in North Lincolnshire | Permalink. It was great to see this – I know the area well. Ermine Street runs from Lincoln north [through Gokewell] to Wintringham [formerly Winteringham, I think.] About that point I understand, the Trent/Humber could be crossed fairly easily, at least at certain times of the year allowing the legions to march on to Eboracum – York. Incidentally the spelling is Santon. Hello Ralph, thanks for the comment. I will edit Santan to Santon – my Dad said it was “Santan”. He worked at Appleby-Frodingham steelworks as a railway shunter. Have a little bit more editing to do on this site, yet. Hope you are well. I find Roman stuff very interesting; my brother is something of an expert on Roman history. Best wishes, Ray.